In my third installment of my favorite brands post series I wanted to write about my absolute favorite nail polish brand of all time – Essie! Many of you know in the world of nail polish there are two major brands (among many others) and they would be O.P.I. and Essie. In college I was an O.P.I. devotee. And then something changed – I’m not sure when or why but I switched completely to Essie forever. As you may remember me saying I was a former marketing major in college, let’s first start with brand’s image and why I love it. 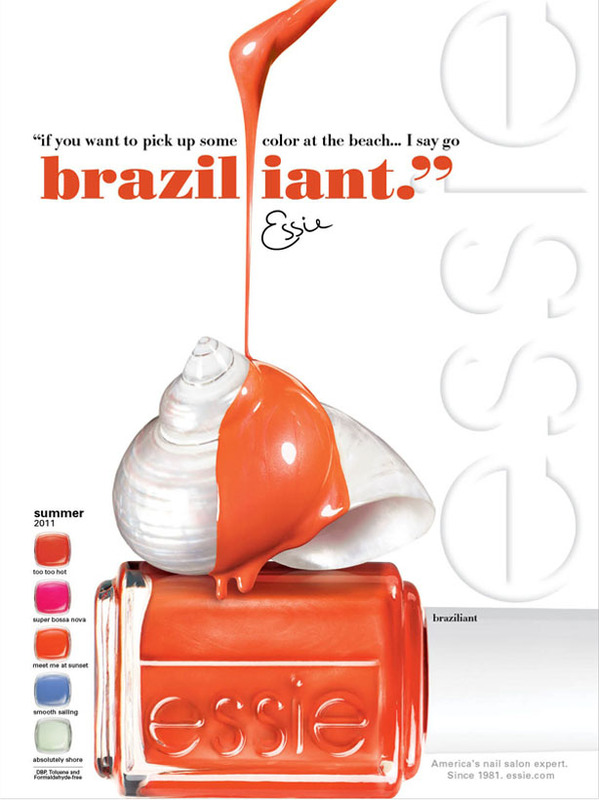 The marketing is fantastic – Essie ads are written with a short quote from Essie herself (how cute is the name Essie by the way?) and the ad is always clean and crisp with the focus on the nail color that practically pops off the page. 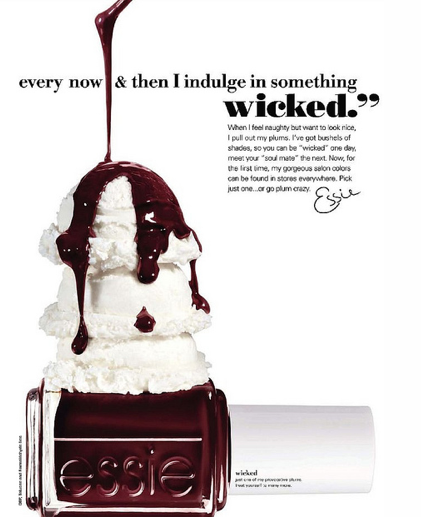 The brand’s ads use white backgrounds featuring white props such as a marshmallow or ice cream with the nail color dripping over it. See below for examples – how great are these? The packaging is adorable too. If you know me well you know I have a weird love of organized shapes (I love cars with shapes). Something about these little perfectly square bottles with the clear writing and clean white top makes me happy. Its simple and lets the color do the talking. And now let’s talk about my favorites! Ballet Slippers – this is a staple among the beauty industry as one of the best pastel pinks out there. Not too pinky, not too beige. Mademoiselle – another staple. This is a sheer pink that is one step above having nothing on. It almost is like nail foundation for those with pink nail beds. Vanity Fairest – similar to Ballet Slippers but has a the teeniest hint of sparkle. Fishnet Stockings– classic red with a blue color base. Gorgeous on short nails. Sunday Funday – coral with a little sparkle – I love this shade in the summer! Under the Twilight– an inky blue purple – I LOVE this on short nails and always get asked what this is when I wear it. Now that Essie is EVERYWHERE you don’t have to travel very far anymore to get them but if you want to order them for cheaper than their regular retail sign up for the flash sale site Cut and Blow – they are $5, which is completely worth it if you buy more than two. Another place to check out for cheap Essie’s? Off-price stores like Ocean State Job Lot, TJ Maxx and Marshalls. In keeping with the blog series about my favorite brands here is yet another brand I love and noticeably cheaper than the last. I have given a lot of different Garnier products a try and I have yet to be disappointed. Some items I tried out on my own out of need and some I had read great reviews on. Unlike my last post about Bobbi Brown, I don’t have an emotional tie to this brand and have no colorful story for you – I just plain like the products! So lets get down to business and I’ll tell you what I use on the regular from this great drugstore brand. Moisture Rescue Gel/Cream – this stuff is amazing! It is so refreshing and hydrating and best of all it oil free. I started using this two years ago when it first came out in the summer and discovered how great it was. In the cooler air I just switched to the dry formula for a little extra moisture and like it as well. It has the same feel as the original and the same refreshing feel when you put it on. Ultra-Lift Anti-Wrinkle Eye Cream – this is a great eye cream and is refreshing as well. Its very inexpensive and just a dab on the under eyes and outside of eyes (where crows feet live) does the job! I put on twice a day, morning and night. Oil Control BB Cream – this is great if you don’t have time for a face full of foundation and want more coverage than a tinted moisturizer. Now the brand has not one, but three different shades of each BB formula (there are currently three – Miracleblur, Oil Control and Anti-Aging) for even more skin matching goodness. BB Dark Circle Correcting Eye Cream – I also use the BB Eye Cream when I use the BB Cream shown above. It has a silver rolling ball that has a really cool, refreshing feel when it is applied to the skin. Recently I tried using Garnier’s hair color and loved it! Its the first at-home hair color that comes with grape seed oil to put right in the formula. This means more moisture and softer and shinier hair. Shampoos and Conditioners – I have used the Color Shield and Damage Eraser hair collections and recommend both of them. They give my strands a soft, silky feel. Below are the ones I have used but click the images to explore what products are right for your hair. Which Garnier products do you love? I originally was going to write one post about my four favorite brands but I decided I wanted to keep each one separate in order to give each one the attention it deserves (as well as keep you in suspense!) Also, that would be a really long blog post and I don’t want to do that to any of you. So here goes – let’s begin this blog series with the Queen – BB, B Squared, Bobbi, whatever you want to call her, she is Bobbi Brown. Where.To.Start. When I was 23 entering my second job (with the first being HORRIBLE) I had a wonderful boss who was stylish, hilarious and quirky. Not to mention obsessed with Bobbi Brown. I admired this woman and she was a wonderful mentor for me as I started my career in corporate retail. I don’t remember how she got me started with Bobbi Brown but she was definitely the influence. At 23 I was making pennies but I remember managing to purchase a product here and a product there and at Christmas and my birthdays she would buy me Bobbi treats so I could add to my growing collection. Slowly I started reading more about Bobbi myself and becoming a fan on my own, not just because my manager was. Why I love the line: In two words – polished and pretty. Bobbi comes out with new products each season obviously just like the other cosmetic lines but her brand and face remains true not trendy and I think that’s what I most admire. The Bobbi face is clean, classic but modern, and can never be accused of trashy or overdone. Even her packaging is classic – I love the black with the thin white writing – still do this day when I see a woman pulling out a Bobbi product I immediately think she is smart for choosing Bobbi. As I started getting older I started getting my mother into Bobbi as well and little by little she also became a convert. Now besides a suggested mascara from myself or her staple Lancome lipstick, she only wears Bobbi. See below for her makeup drawer – (I got my father to sneak a couple of pictures for this post). 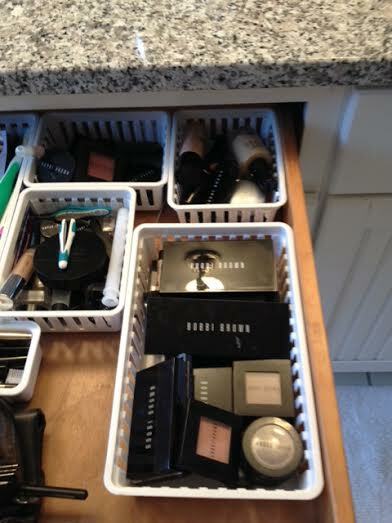 Seriously – how amazing is that drawer full of Bobbi? When I come visit I’m like a kid in a candy store. I too have my own Bobbi collection (obviously as I’m writing this post about her) and my mother is very generous in treating me at Christmas to beautiful pallets of eye shadow and lip color as well as as the ever popular Beach perfume and lotion. Shimmer Brick – comes in a handful of color ranges but this is the bronze. You use this for highlighting your upper cheeks, forehead and bridge of nose. Oh and bonus? You can use all those colors as eye shadows! Bronzer – yep, I just plopped $40 down about a month ago for this but you know what? This is only the second one I have ever bought and its the best bronzer I have ever used. Its so natural looking, not muddy and blends well. Long-wear cream eye shadow – this came out years ago and started the cream shadow craze. Its absolutely gorgeous on and the best part is there is no shadow fall like you get from powder shadow. Long-wear gel eyeliner – yep she started this craze too. Apply with a brush to create a beautiful line and make it either dramatic or soft. Rouge pot for lips and cheeks – I used this on my friend when I did her makeup for her wedding and ended up using it on her mother as well as myself. Such a great product and very versatile. I was not feeling well this evening so I decided to take advantage of some down time and give my brushes and tools a good cleaning. How often and how much is really dependent on how much you use your products but if you’re using them regularly you should think about doing it weekly or bi-weekly. It might seem like a lot, but remember these things are touching your face over and over again and trap bacteria, dust and dirt. You don’t want that on your face, do you? Me either. So let’s get down to it. Make sure you have all your brushes and tools ready before cleaning. Put a dry towel or a few paper towels down flat next to your sink where your brushes can be left and dried after washing. You want to wash your brushes with a gentle soap and ones specifically made for cleaning are the best. You can find them anywhere now – I have one from Sephora that has lasted forever but you can buy ones at the drugstore or specialty makeup store. If worse comes to worse you can also use Johnson & Johnson Baby Shampoo as its gentle (and cheap!). Take your first brush, put it under running warm water and then put a little bit of soap on the brush. I then rub the brush on the back of my hand until I can see all the makeup coming out. I repeat this as well as run under warm water again until the water is clear. I give the brush’s hair a gentle squeeze and then lay it flat on the towel to dry. I fan out the brush strands so that they are not clumped together. Repeat with all your brushes and tools. Make sure you’re drying in an open, dry area. I would avoid the bathroom if its warm and damp in there. It can take a few hours to have those babies dry so I like it do it overnight so I can use them in the morning. 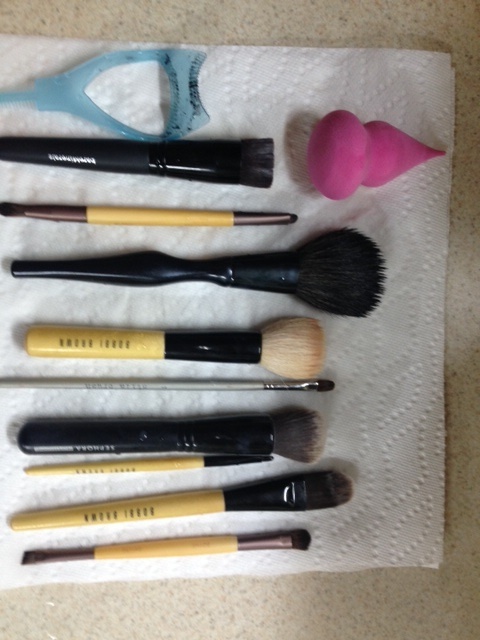 Below is the link to the Sephora product I use as well as a picture of my brushes drying. 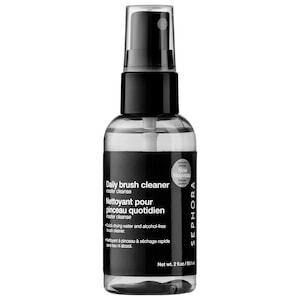 There is also a spray that you can purchase from Sephora called a Daily Makeup Brush Cleanser. 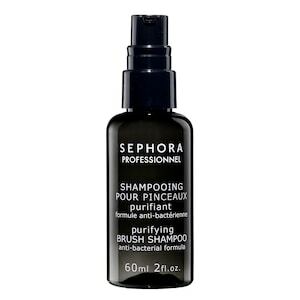 I would use this for items like eyeliner brushes and eye shadow brushes because if you leave that kind of product on, it will make the brush almost not useable for the next time so it needs a quick removal of product even if its not a deep cleansing. I love a good manicure and pedicure and I love the nail salon near our house in Newton, Massachusetts. It’s always nice to treat yourself to these often not only because of the stress relief and beauty benefits but because you don’t want things like overgrown cuticles (which keep your nails healthy and prevent infection), callasuses, and in grown nails out of control. That said, time and financial reasons don’t always allow for us to do these regularly but with a little work you can do your own manicure at home. It might take a little practice if you’re just starting out but be patient and take your time. The more you do it, the better you will get-trust me. Step 1: Soak hands. Soak both hands in a little bit of warm, soapy water for a few minutes. This gets your cuticles ready for grooming. Step 2: Removing cuticles. Apply a cuticle remover (see link below for options from Sally Hansen) rub in to cuticles for a few seconds. Next, take a push back tool (this will be one of the most expensive items you will purchase in this post) and push back your cuticles. You have two types of cuticles, the ones you want to get rid of (the thin later right on your nail that you can hardly see) and the thicker part that you either leave or trim back in the next step. Step 3: Trimming cuticles. This is up to you on how much you want to do here as you may not feel comfortable trimming your cuticles and hang nails. If you do feel comfortable, you want to purchase cuticle scissors and I suggest not purchasing cheap ones and go with some by Revlon. You will have these forever and they really make a difference. Cheaper ones are dull which makes it more difficult to snip and get a clean line. Make sure these are clean before you use and gently trim your outer cuticles, hang nails and excess skin. My fiance could tell you this is one of my favorite tools- I’m often snipping away at random hang nails as any excess drives me crazy. Remember to clean your metal and stainless steel tools with soap and really hot water you are done with everything. Repeat Step 2 and 3 on the other side once completed. Step 4: Oil up. Next rub some nail oil into your nails and cuticles. If you don’t have any at home you can use olive, coconut or grape seed oil instead. You just need a few drops, so go easy. Step 5: Filing nails. Your shape is up to you but I usually do something in the squoval (combination of square and oval) range so they are not super severe either way. You don’t need an expensive or heavy-duty nail file (unless you have artificial nails) so your best bet is to get the cheap, tan cardboard kind that are sold in the drug store. These are gentler on your nails than other files. If you don’t want to use these make sure you pick a file that says its specific for natural nails or else you will file down your nails until there is nothing very easily. Step 6: Buffing nails. This is your choice as the shinier the nail, the harder it is for nail polish to adhere to the natural nail but I enjoy doing this because it gets ride of ridges and smooths out the nail bed. I use buffers that are four-sided and have numbers on each side so you know which step to do in which order. Step 6: Exfoliation (optional). This is not necessary but its nice step that adds a little luxury to your standard manicure. Don’t have an exfoliating rub? No problem. Mix 2 tablespoons of either sugar or salt with a little bit of oil (again your choice) and rub over your hands, wrists and lower arms. Rinse under warm water and pat dry. Step 7: Moisturize. You can use any lotion you like. Make sure you rub into nails and into cuticles. After, take a cotton round and wipe nails off with nail polish remove (preferably acetone free since acetone can dry our your nails and skin). Step 8: Prep. This is not mandatory but its a nice step and if you are using a dark or bright color you should make sure to include this into your manicure regimen. If not, when you go to remove your color days or a week later your nails will be stained and most likely a dark pink. Choose your base coat by your need: trying to grow your nails? Choose a growth treatment. Weak nail problems? Choose a formula with strength. When all else fails just choose clear since something is better than nothing. Often times this is where my manicure will end since just having groomed nails and cuticles is good enough for me. If I have the extra time and patience I will continue on to the steps below for color. Step 9: Color. Choose your color. I love dark and bright colors on short nails and soft pinks on nails with a little length. How many coats is up to you but the standard is two coats. Your application should be as follows: one stroke down the middle of the nail, and then one stock on each side. Nervous? Go lightly on the polish for the first coat since it sets the base for your color. You can always apply more color if needed. Remove any excess polish that got on your skin with orange sticks from the drugstore (I LOVE these things). If you don’t get it perfect that’s ok. Remember that polish doesn’t stay on the skin for long, so it should come off in your shower or when you wash your hands. My favorites colors? Essie’s Ballet Slippers, Mademoiselle, Vanity Fairest and Figi. I know, I know. All light pinks – notice a trend? Step 10: Top coat. Any basic clear does the job but if you want the creme of the crop choose Seche Vite. It dries your nails quickly and deposits a glass-like shine. This is a must-have and really ups your manicure at home. Also, one bottle lasts forever. Step 11: Wait! After all that work, wait it out at least a good 15 minutes. Watch tv, work on the computer (slowly) or just relax. A trick my mother (a former hairdresser who had to take manicure classes during beauty school) taught me to check if your nails are dry is to take your thumb and lightly rub it against the skin under your nose, above your lip. If the nail is ready and dry, there will be no stickiness and the nail will feel like glass against the skin. If it doesn’t, you need to wait a bit more.